Candy fundraisers are big earners because candy is always so popular. People buy it for themselves and they give it out as gifts. And, of course, kids especially love it. You can do candy fundraising with few volunteers, so it is ideal for small or large fundraising groups. One reason candy sells so well is because it is generally inexpensive. People are much more willing to pay a dollar or so for a candy bar than, say, $14 for a small tin of flavored popcorn. Ouch! Nobody wants to get gouged. Indeed, candy works well as a money making tool for all types of fundraising groups, regardless of the income level of the community. 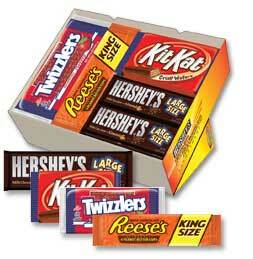 Kids, who are usually quite effective at selling candy, can take boxes (chocolate bars, lollipops, etc.) door-to-door to sell in their own neighborhoods (in most cases you’ll want an adult to accompany them) and parents can take boxes, samples or order forms to work and get their coworkers to help with the fundraiser. Champion candy sellers don’t stop there. They approach local businesses, call out-of-state relatives, set up booths at grocery stores and root out buyers everywhere they can. Everyone is a potential customer. Is there a best time of year? Nope. Candy selling works well any time of the year. However, if you can time your candy promotions to coincide with the “candy holidays”, including Halloween, Christmas, Valentine’s Day and Easter, you might get even more orders. Start with a reputable company such as Fundraising.com. They provide several brands of candies and the promotional brochures along with order forms. There is a minimum purchase required, but you can make up to a 60% profit. Catapult sales among your volunteers by awarding prizes, such as movie tickets, dinner coupons, video games, etc. to the individuals who get the most orders and/or those who bring in the most money. This works for a lot of different events, not just chocolate bar fundraisers. Another way to boost sales is for your volunteers to set up a booth with your candy boxes prominently displayed at a busy grocery store entrance (many stores will allow this for non-profit groups) or at a school athletic event, or even during Election Night at schools. Big hint: go where the people are. There are a lot of different candy bar fundraisers for schools, churches and other non profit organizations to select from. There are the chocolate giants like Hershey and Nestle, which offer brands everyone is familiar with, like Reese’s, KitKat, Butterfinger, Baby Ruth bars, etc. But there are also less well-known chocolate fundraiser companies, such as Kathryn Beich, One Dollar Bar, Chocolatiers and Skinny Cows. 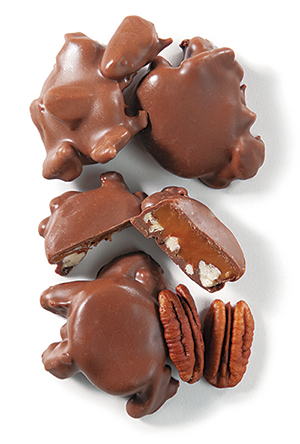 Fundraising.com – Providing a big selection of gourmet chocolate choices and candy boxes for fundraising, including Hershey’s, Nestle’s, Chocolatiers, Kathryn Beich candy and Dollar Bar. 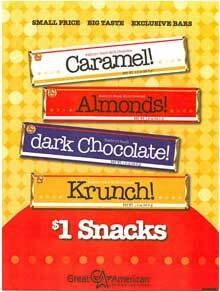 The $2 chocolate bars have proven to be the most popular and most profitable chocolate fundraiser. Kathryn Beich Katydids also have exceptionally high demand. Get a free formation kit, free prize program and free shipping. Call toll free 1-866-216-2080.